Sitting ‘correctly’ is something of a oxymoron. The hallmark of a ‘good’ chair is that it allows or encourages movement, that it isn’t ‘too’ comfortable (because you’ll stay on it too long! ), and that it allows uprightness, because the biggest challenge we humans have is carrying our big heads around without developing neck & shoulder problems. 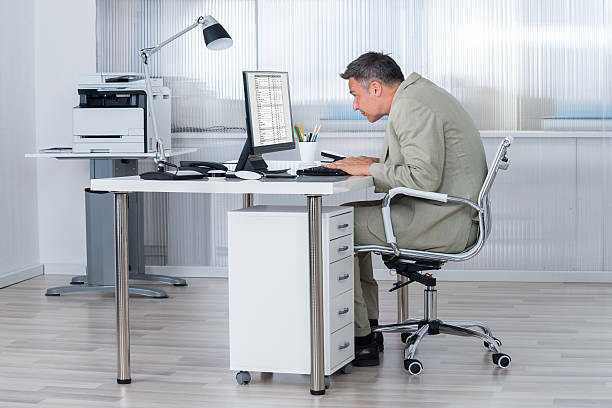 There are only 2 ways to do that – lying horizontally or sitting or standing so that our heads are actually balanced on top of our shoulders, something that is a particular challenge whilst using smartphone, laptops or horizontal desking. Sitting is a recent development in our evolution. In fact you could say that we were not designed to sit at all! The closest primitive man came to sitting was squatting. Recent research has identified sitting & especially physical inactivity whilst sitting, as a disease leading to problems which can shorten our lives. Apparently all the exercise in the world cannot rectify the damage done by more than 6 hours of inactive sitting a day. Sitting is ubiquitous in modern society, in fact when we are not walking or lying down we are generally to be found sitting in chairs of various kinds. Think about it – many sit at work, we sit on trains, we sit in planes & cars to travel, we sit to rest, we sit to eat. When it comes to work we are often sitting in front of computer screens. Let’s think specifically about that last sitting scenario – sitting at a computer for work. Modern ergonomic chair design started in the 1970’s with Peter Opsvik’s kneeling ‘variable’ chair, inspired in part by the horse riding position where the legs hang down from the saddle around the flanks of the horse. The main feature of the kneeling chair is not the kneeling, but the fact that the knees are lower than the hips, promoting a more effortless uprightness, together with movement simulated by the rocking design. Interestingly, cheap non-rocking copies of this chair were sold in their thousands by unscrupulous catalogue salesmen & proved pretty uncomfortable, probably giving the whole concept a bad name! There are also saddle type chairs, but curiously they also tend not to be moveable! Later, Opsvik applied the same thinking to office chairs which incorporate forward tilting moving seats with backrests, & optional adjustable head & armrest support. Another notable recent advance is the LimbIC Intelligent Chair, developed by neuroscience but more about that another time. Nowadays there are a number of ergonomic chairs to choose from but beware they are vastly outnumbered by other chairs just pretending to be ergonomic through clever design & huge marketing budgets! Roger trained first with Joseph Heller (Body of Knowledge Inc.) in 1983 and Steven Shaw (Art of Swimming Ltd) in 1996. Now he is known as Doctor Posture, Hellerwork Practitioner, Zen Swimming Master, and author of The Owners Guide to the Body.